In brief, Roka develops a sci-fi board game about collecting dirty magazines and forces Kenji to get Takao to play with them, causing him to owe Takao a favor for nothing. Roka and Chitose crash Kenji’s class at lunch to force him to eat lunch with them, where they learn why he never skips Sean Connery-sensei’s class. Kenji finds someone Roka is terrified of, then learns from Funabori that this guy (SHIOU Hachi) is actually a member of the Game Development Club (Temp). Roka bags Kenji for accidentally hurting her, but when Funabori presents it cleaned and pressed the next day, a school-wide competition happens over whom will be the owner of said bag. This leads to a final battle between Roka and Kenji. Have I mentioned how much I love this manga? I really do. This kind of insane, wacky comedy is right up my alley! And then there’s a harem element lain in as well, which I find most enjoyable. To get things started, there’s no doubt now that Takao is head over heels for Kenji. I honestly can’t understand why, since he’s a punk (but a long suffering, funny one). However, whatever her reasons are, this tsundere attraction she has for Kenji is humorous and cute at the same time. Her cute side comes from the fact that while she’s timid and a “fraidycat” at times, she manages to find the courage to stand up for what she believes in. That makes her such a likeable character. On Takao’s humor side, it isn’t just her reactions to the nuttiness she finds herself getting swept into. It is also things like her zipping up her jacket over her large chest, only to have the zipper explode off unexpectedly and take out Kenji. That had me laughing a lot more than I expected. Takao’s battle with Roka in musical chairs during the tournament to get Roka’s used bag was hilarious as well. 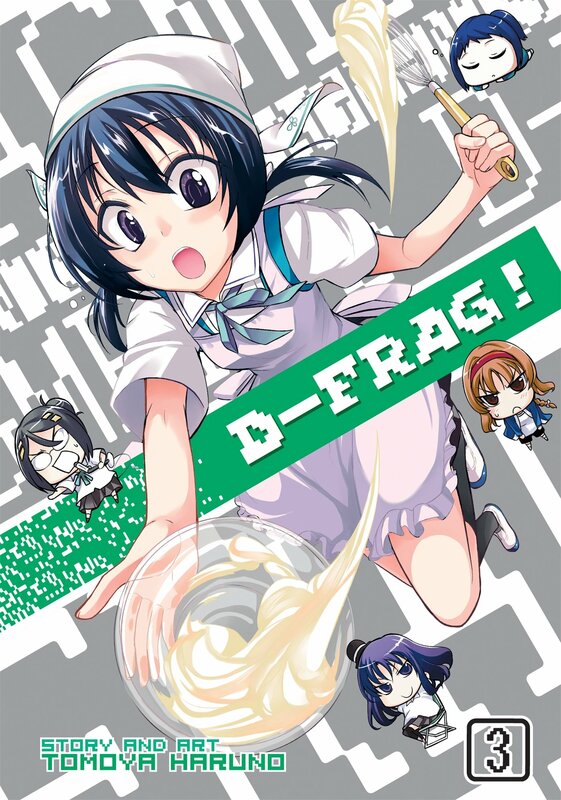 This volume also introduces the harem aspect to the D-Frag manga. One could say that Roka has feelings for Kenji, but they aren’t shown in the normal way one might expect. However, Haruno-sensei takes a character (Funabori) just mentioned as an aside in the previous volume and then makes her a major supporting character. Not only that, but Funabori is shown to have feelings for Kenji as well. She’s stated to be the perfect housewife material. It is a shame she comes off as very timid as well, but I still like her. Another character introduced is the rich guy named Hachi. He introduces another wacky comedy element by having an unrequited love for Roka. At the same time, he is like kryptonite to Roka. So he’s a good addition to the manga. I don’t like tournaments in shounen battle manga because they are boring. However, having a tournament over Roka’s bag just had me in stitches, some of which I’ve mentioned above (such as Takao’s zipper incident). It was humorous to me that Roka and Kenji have to battle in the final round and go on about their luck. Kenji’s story about finding Tama-chan’s money makes me think she’ll show up to be the sister of one of the characters that have been introduced. Only Tama-chan won’t be a crying little girl, but a punk little girl with a nasty attitude. That would be funny. Finally, in an ultimate sign of how D-Frag can go literally anywhere, Haruno-sensei actually has Scottish actor Sean Connery as a teacher in his manga. I hope we see more of him because he ended up being a lot of fun. On the Seven Seas side of things, Japanese honorifics are used. We get a couple of color pages at the start, and some omake manga at the end. The one that interests me the most is the one depicting Haruno-sensei and his editor discussing things, including Furabori suddenly becoming a supporting character. Good stuff. 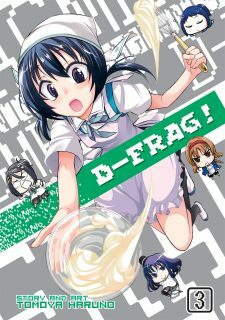 In the end, I doubt I’ve managed to properly convey how awesome I think D-Frag! volume 03 is. However, if you like nutty comedy series where the unexpected is always going to happen, the first three volumes of this series fit that bill perfectly.